He ate with His apostles the Paschal lamb which was a type of Himself; it was eaten with bitter herbs and unleavened bread; they ate it standing with clothes girded, and staff in hand, in remembrance of the hurried escape of the Jews from Egypt. (Exod. XII.) After having eaten the Paschal lamb our Lord with profound humility washed the feet of His apostles, exhorting them to practise the same humility and charity; afterwards, He gave them His Flesh and Blood under the appearance of bread and wine, for spiritual food and drink, thus instituting the Most Holy Sacrament of the Altar, the Sacrifice of the Mass, and the priesthood; for when He said to the apostles: Do this in commemoration of me, he ordained them priests. After this He held His last discourse in which He particularly recommended brotherly love; said that beautiful, high-priestly prayer, in which He implored His Heavenly Father particularly for the unity of His Church. He then went as usual to Mount Olivet, where He commenced His passion with prayer and resignation to the will of His Father, suffering intense, deathlike agony, which was so great that He sweated blood. Here Judas betrayed Him into the hands of the Jews, by a treacherous kiss. They bound Him and led Him to the high-priests, Annas and Caiphas, where He was sentenced to death by the council, and denied by Peter. GOSPEL (John XIII. 1-15.) 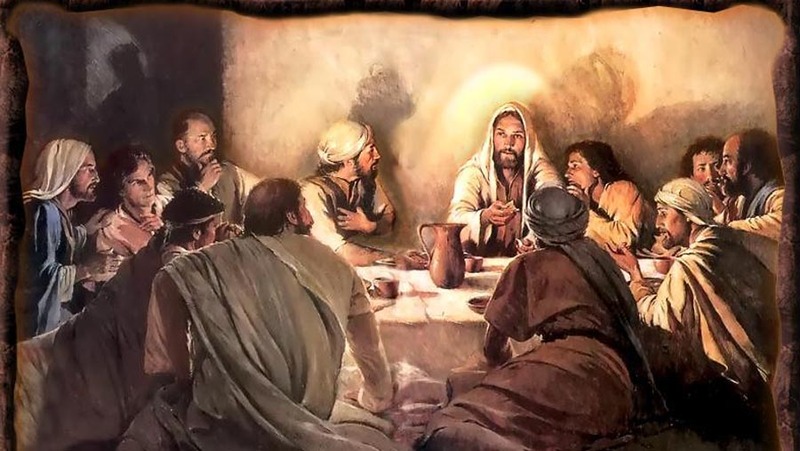 Before the festival day of the Pasch, Jesus knowing that his hour was come, that he should pass out of this world to the Father: having loved, his own who were in the world, he loved them to the end. And when supper was done, the devil having now put into the heart of Judas, the son of Simon Iscariot, to betray him: knowing that the Father had given him all things into his hands, and that he came from God, and goeth to God: he riseth from supper, and layeth aside his garments: and having taken a towel, he girded himself. After that, he poureth water into a basin, and began to wash the feet of the disciples, and to wipe them with the towel, wherewith he was girt. He cometh therefore to Simon Peter, and Peter saith to him: Lord, dost thou wash my feet? Jesus answered, and said to him: What I do, thou knowest not now, but thou shalt know hereafter. Peter saith to him: Thou, shalt never wash my feet. Jesus answered him: If I wash thee, not, thou shalt have no part with me. Simon Peter saith to him: Lord! not only my feet, but also my hands and my head. Jesus saith to him: He that is washed, needeth not but to wash his feet, but is clean wholly. And you are clean, but not all. For he knew who he was that would betray him: therefore he said: You are not all clean. Then after he had washed their feet, and taken his garments, being set down again, he said to them: Know you what I have done to you? You call me Master, and Lord: and you say well, for so I am. If then I, being your Lord and Master, have washed your feet, you also ought to wash one another's feet. For I have given you an example that as I have done to you so do you also. It is the office which the clergy say on Wednesday, Thursday, and Friday of this week, accompanied by the lamentations of the Prophet Jeremias, and other ceremonies. Tenebrae means darkness, and represents the prayers formerly said in the dark hours of the morning. In the Tenebrae the Church mourns the passion and death of Jesus, and urges her children to return to God; she therefore makes use of those mournful words of Jeremias: “Jerusalem! Jerusalem, be converted to the Lord, thy God!" Because the Tenebrae, as has been already remarked, in the earliest times of the Church, were held in the night, the candles were extinguished one after another, as the daylight gradually approached they were no longer, necessary; again, at the time of the passion and death of Jesus, His apostles whom He calls the light of the world, one after another gradually left Him; at the death of Christ the earth was covered with darkness. The Jews, blinded by pride, would not recognize Christ as the Saviour of the world, and therefore fell by His death into the deepest darkness of hardened infidelity. REMARK In the Cathedrals the holy oils which are used in Baptism, Confirmation, Holy Orders, and Extreme Unction, as also in consecrating baptismal fonts and altar stones, are blessed on this day. Let us thank our Lard for the institution of these Sacraments at which blessed oils are used.